It's Wednesday, and that means another episode of The Star Wars Show just dropped on YouTube! The webseries, hosted by Anthony Carboni and Andi Gutierrez, has been including exclusive behind the scenes looks at Solo: A Star Wars Story in some of its most recent episodes, and this newest one is no different. This week, Pablo Hidalgo of the Lucasfilm Story Group gives us a sneak peek at the set of a Corellian marketplace, the site of Han and Qi'ra's exciting escape from Lady Proxima's lair, and subsequent chase through the streets of Corellia. 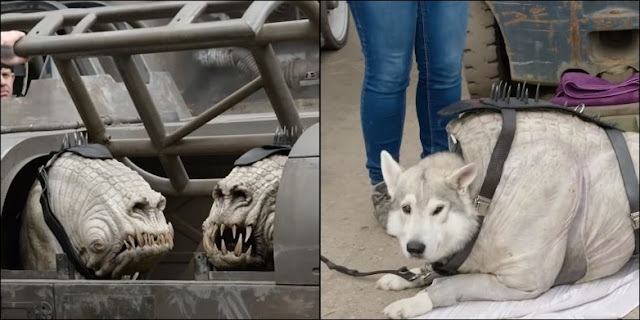 Pablo chats with with some of the supervisors and actors that made the scene possible, and also takes a closer look at the Corellian Hounds that Molloch and his goons use to hunt down our heroes. Surprisingly, the creatures were are not created using CG effects but were, in fact, real life Dogs in special costumes. Catch Solo: A Star Wars Story in theaters now!